There have been a few post on pulsating brakes, one cause is a warped disk. It is not a very common thing with floating disks brakes because they float on a band of rings and the rotor itself is heat tempered. However a dragging brake pad can heat up a disk and warp it. 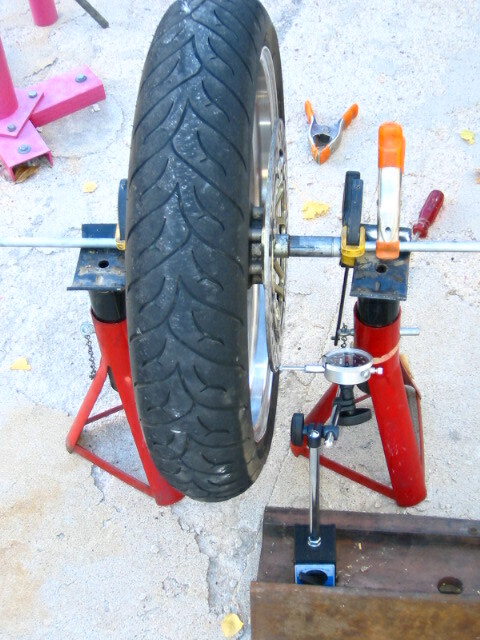 I have been getting alot of pulsation in my brakes as I begin to apply them, I suspected the rear brake, it is difficult to tell, so I put the bike on the rear stand and turned it to see if it was rubbing, I could not feel any rubbing so I turned next to the front wheel. I jacked up the front wheel and this time I could feel the brakes rubbing as I turned the wheel, somthing was wrong. There were several possibilties, due to the fact that it would only rub at a certain position, It could have been a warped disk or the axel was bent. 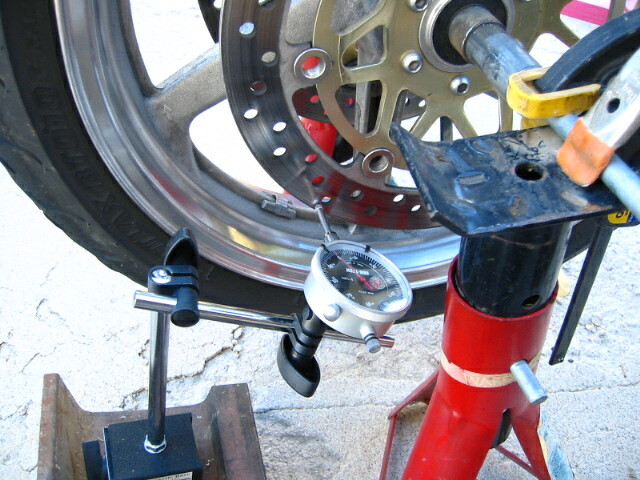 I dont have a truing stand so I used my handy dandy Miguel special, 2 jack stands a rod and a bunch of clamps, I have a dial indicator I bought for around $30 bucks some years ago when I was going to rebuild a car engine, I removed the wheel and set up a way to turn the wheel smoothly. Here is my setup this is from behind. It worked great, no false readings from the stands moving. 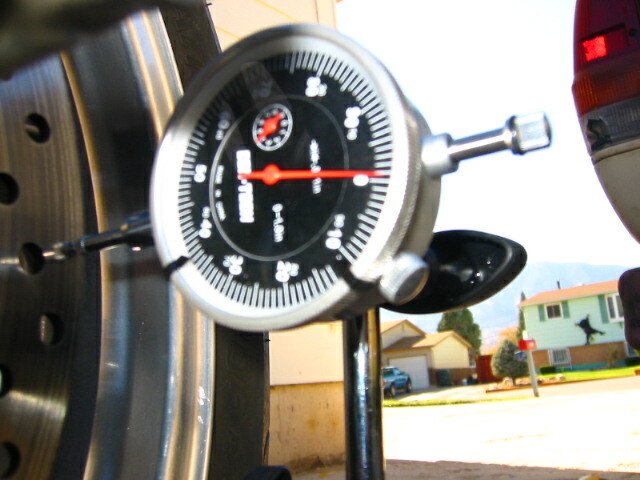 The clamps worked well, I had my magnetic dial base on a heavy hunk of rail road rail. For good measure I tried a different measurement by taking off the bolts and sliding it where it was mounted, the measurements were the same. I took it to the salvage shop, they did not have one in stock, but there are a few bike that share the same rotor for a 98-01 VFR, unfortunatly they cannont be machined, they must be replaced, I priced it out at $249 retail, and around $190 for discounted price, salvaged price varied from $120 to $175 ouch!! I recently tried prying a warped disk back into spec with a large crecent wrench, as long as the carrier is not bent out of shape the floating disk can be tweaked a bit one way or another to get it back in spec. 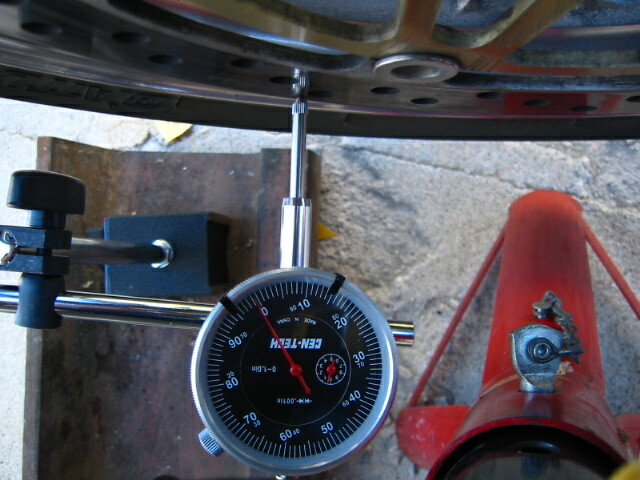 I tried it on my wheel balance station with the dial indicator there to show me where to pull or push on the disk, then run the wheel around and remeasure until its within spec. It might warp again but a few times of this and it will stay, this will only work if its not too far out, and the carrier is not bent. Before the flames start coming here is the proper way to straighten your rotors. Understand that this is my opinion and my process and use of the instructions on your machine is your responsibility. I do not warrant the process and am sharing this for educational purposes only. Background, 2000 VFR with 26K miles, just did the brakes and new Pilots. Hence the problem, either I or the shop was sloppy on handling the front wheel. This caused an annoying shake on braking, and when I was coasting to a stop with the front lever pulled to allow the pad to drag, received an obvious warp feeling in the bike as the bike would grab then coast at the speed of the front wheel turn. Nothing to drastic, but felt out of spec. 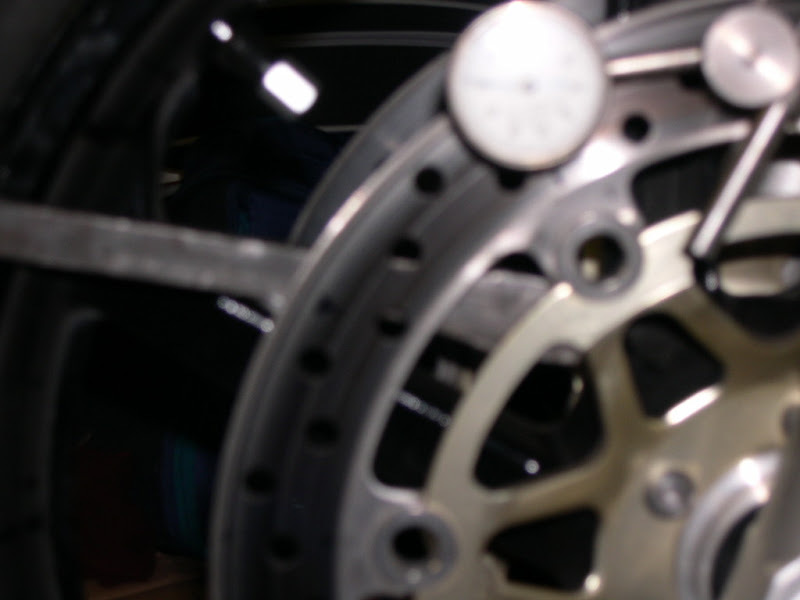 The rotors are made of two parts the braking surface and the inner mounting plate. There are two scenarios, either the brake surface is warped or the mounting plate is bent. Since the mounting plate is more suspect I assumed that when I began. Also note for the anti-straightites, brakes need their strength in the X-plane, this process is manipulating the rotor in the Z-Plane, and only by +/- 20/1000th of an inch, no where near the deflection to cause metal fatique. Also do not hammer, shows total lack of control, this is a delicate machine put the persuasion away and use your pry bar. Note I am 6'3" & 285lb with a will to bend, the rotor was relatively easy to move...and the pressure you place on the tire/rim is minimal, as long as you wrap the pry bar all should be fine. The key is to take it easy and watch the ZDI. 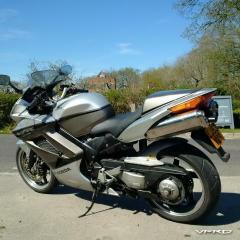 Step 1) Get yourself a VFR that has a brake rotor rub or warp shimmy. 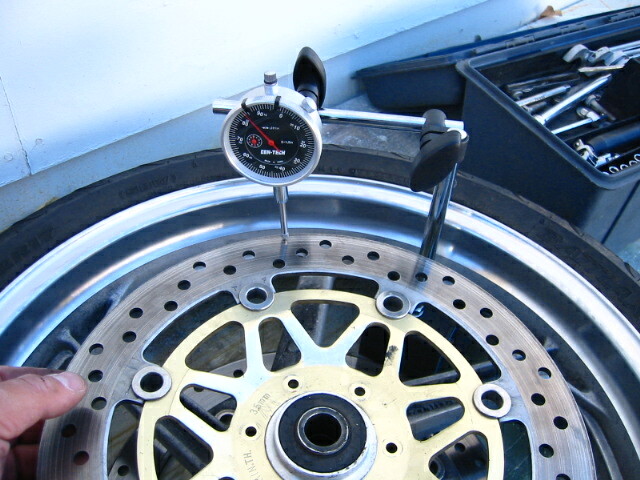 Spec for the run out on the rotors is 12/1000th, that is the total deflection from the highest to the lowest. This confirms 2 things, different ways. Since the ZDI is showing the rotor pushed in it confirms the rotor was either hit or moved from sloppy handling. It also confirms that the mounting plate is the weak link, and the rotor is in fact not warped. You may be asking why the numbers vary up or down on the same rotor as you move in. All perfectly plausible with imperfection in the wear and the original turn when the rotor was new. Now the fix, I need to bend the mounting plate to zero, with the ZDI on the point that is furthest from zero I get the pry bar behind the rotor to leverage the wheel to push the plate out, away from the wheel. This is a very delicate process and you have had to work with metal before to understand how to bend it without stressing it, and to get it to move to zero. Donâ€™t worry if you move it to far, you can bend it back. I wrapped the pry bar in a shop towel to minimize and scratching. Watch the ZDI to make sure you keep it in spec. I found that I moved it about 20-35 thousandths past zero to get the plate to settle at zero. Same shot further back - the key is to get behind the strut that connects to the rotor, NOT THE CIRCLE that the rotor floats on. Took the bike out and made about 8 hard stops and a slow stop, no shake and no shimmy and no brake drag as the wheel rotated. Felt like a new rotor, 1000% better then before. I then brought in jacked it up and checked the run out while the rotors were hot. I will work with bike over the next few months and monitor the run out. I will assume that I have at least one more adjustment as the heat gets into the brakes, but then it should be set. I will post follow-ups as I track it myself. Good luck if you take this on, this was my experience, yours may vary. On CBR accidentally tweaked a rotor breaking a bead. Damn! But just careful gentle pry-work as described above worked perfectly to realign the disc.Using the dial indicator is essential. I was the carrier that bent and not the steel brake disc as far as I could tell. Worked fine afterwards. Best not to fubar them in the first place, tho. I notice this is a floating disc system isn't there some play in the 'buttons ' that join the carrier to the disc? In My Garage::'99 VFR, SV650S, Guzzi Daytona,2-LeMans,V50,Aprilia RS125, FZR400, VTR250, T500/RD. For those without the tools (or stomach to do the work described), there's www.woodyswirewheels.com in Denver. (I shun the brute force/delicate combo. YMMV). buddy of mine had a bin of parts he bought...I needed new rotors (Galfers down the the min thickness were shot and pulsing horribly) and the price was more than fair. However, both were not in spec for runout. One was more than 1/8 inch (130 thou plus!...) out and the other around 50 thou out. I went and bought a Harbor Freight dial indicator and a magnetic base with adjustible arm for less than $30 and proceeded to do the suggested method above. I drilled a 5/16" hole in a c-clamp and the adjustable arm was bolted to the C-clamp and I clamped the thing down to the fork leg as in the description above. A 24 inch bar is probably about 6" to 12" too short...but I managed to budge the carriers of both back into spec...I could have done down to .001 runout, but it was around 1am when I finished (started at 10:30 PM) so I was toast...still satisfactory results...the only thing is that I needed to push the carrier out between 30 and 40 thou past zero to get it to come back in to zero...that's about the only difference. 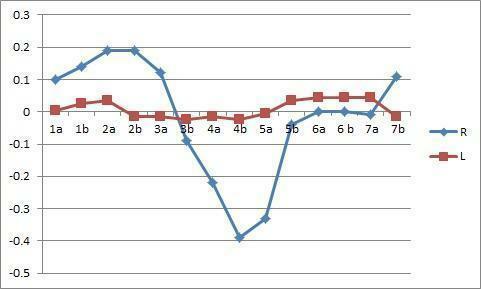 Here's the data for the left and right rotors before and after with some pics of the setup. Darned if I know how or why, but midway through a ride on Sunday I noticed the front brake start pulsing. I have followed the extremely helpful instructions above (the g-clamp base was inspired!) and determined my right rotor now has 0.58mm (22 thou) of runout (service limit is 0.3mm) at the carrier, so I'll be attempting to correct that with some gentle prying tonight. The left rotor by comparison is near perfect with just 0.07mm runout. Thanks to HispanicSlammer, Ferchja and Zupatun for taking the time to post your methods.I hope I get the same good outcome. I'm curious, has anyone ever tried cleaning the disc brake bobbins to "unbind" them so the discs can float properly in the carrier? I'd never heard of this before but it seems to make sense and would be easy to try. Oh yeah I clean them once a year and does help. Also 3M the rotor's. Neat never saw that...will have to do that a couple times a year. Well I don't know if there is any coincidence, but I cleaned my bobbins the day before I noticed the wobbling rotor! Beats me whether this caused the runout or whether it was always there and I was just paying more attention. Anyway, I managed to straighten the carrier last night so there's now 0.12mm runout, have yet to test ride but I can feel the difference just spinning the wheel. Oi! That boffin's right brilliant he is! Before floating rotors, they were hard mounted . the floaters are not hard fixed and may show out of round till you get on the brakes and they align. Unless of course they are severely bent. That's what the rivets are for, to allow flexing to properly align. Well, I was curious too and phoned EBC's technical support in the UK. They have never heard of this, nor would they recommend doing it. If you still want to go ahead, because neglect caused matters to corrode, be careful not to over tighten the bolt and nut because you do not want to compress the bobbin to a point it may damage or crack. So this goes into the category "broodje aap"
+1 this thread makes me cringe, a brake rotor is a life saving device & any failure can be life threatening yet people are willing to force tempered material straight when warped & use other means to free up locating bobbins. I hope those willing to do such things have the parts x-rayed before reuse, but then that would cost more than simply replacing the faulty parts. Please people replace faulty rotors with new ones your life is worth it. I'd like to chime in on pulsing brakes and uneven transfer of pad material as a cause. I did a delink with 5/8" front master cylinder and RC51 SP2 calipers [32mm/30mm pistons] on my 5th gen. These brakes were operating smoothly, running Galfer street/track pads with 80% pad left. Then I rode member RVFR's 5th gen. His full CBR600F4i front brake system [5/8" master cylinder and F4i calipers with 32mm/34mm pistons] running OEM pads STOPPED LIKE WOW with full control, great modulation. Installed OEM pads in my SP2 front calipers. I carefully scuffed the existing stock rotors with emery paper, starting with coarse, then medium, then fine, to remove material the Galfer pads had deposited on the rotors' surface. Cleaned the rotors with brake cleaning fluid until rag came away clean. [1A] Noted that the brakes with new OEM pads were working normally on surface streets and freeway on the way out to the country road where I would bed the pads. Bedded the pads in to transfer pad material from the new OEM pads to the just-scuffed rotors. All brake applications were made smoothly, starting with light lever pressure then increasing quickly to high lever pressure, then releasing steadily, never 'snapping' the lever pressure off. Made 6 hard decelerations from 70mph to 30mph, with no cooling time between brake applications and never slowing to less than 25mph [Never coming to a complete stop]. After the 6 decelerations from 70mph to 30mph, was careful not to come to complete stop and rode with no brakes for several minutes to allow full cooling of the brake components. Front brakes pulsed intensely from high speeds [80-100mph] or mid speeds [50-70mph] all the way down to 20mph or less before they smoothed out. Even at 20-30mph, strong application of the brakes caused pulsing. I believe I started too hard on the bedding in process; I probably should have done 4-6 decelerations from 40mph to 20 mph with modest lever pressure before moving on to repeated heavy braking from higher speeds. In the bedding process I applied too much brake force too suddenly and deposited pad material unevenly. I went back to the emery paper and scuffed the rotors again, doing three rounds on each side of each rotor with coarse, medium, then fine emery paper. The pulsing smoothed out somewhat, and now, 1200 miles later, has smoothed further, but is not gone. Possibly have rotors bead blasted. Possibly send rotors to truedisk [truedisk.net] to have them ground flat. Possibly install new OEM pads after bead blasting or flat grinding. I gave the discs a good clean down and took them for a test ride, instantly I had lost the slight judder on braking. I can see where people are coming from saying this could damage the bobbins or crush them but if you need to tighten an M5 bolt and two flat washers so hard that you flatten or warp the bobbins it would be 1 of 2 things.. 1) You are using far too much force to tighten the nuts, and if they are that hard to turn they are damaged anyway....2) Bobbins are usually stainless so if they do deform they must be too soft to withstand the mechanical strain usually in employed on brake discs. What does make me cringe is advocating straightening the disc carrier with a bar. IF the bobbins are free enough to allow the manufacturers recommended movement it wouldn't warp the disc and if the carrier is warped enough to add run out to the disc I certainly wouldn't try and bend them THAT far to get them re-aligned. Took it to a shop and the discs were warped badly. I had to put new rotors on to fix it. if the discs were warped then cleaning the bobbins wont do anything, but if the carrier is bent it might allow the steel of the disc to find it's own true by not pulling them out of shape. TBH I was prepared to go buy new discs but the bobbin clean cured it. I went by process of elimination. Tried the easy "diy" steps first before getting the discs checked at a friends shop. You're lucky the bobbin clean cured your issue. Yeah me too, it's the Scotsman in me... too tight to buy anything I can't fix unless I have to.